Choosing the best ball peen hammer (or ball-pein hammer) means selecting a tool that’s designed to work best for the projects you typically work on. The smaller 8 ounce models are ideal for light use such as upholstery or fabrication and the larger 24 or even 32 ounce hammers are best for heavy use and serious metal work. If you work under a variety of conditions, it may be a better idea to have multiple sizes and types of hammers at your disposal, as a single head weight won’t fulfill every task you may need a ball-peen hammer for. This sturdy steel hammer was forged as a single piece to prevent breakage. A bonded and molded shock reduction grip reduces impact vibrations by 70 percent and adds comfort for long jobs. All exposed metal is fully polished to make this tool one that looks as good as it functions. There’s no denying the well-earned reputation of an Estwing, and this hammer has been used everywhere from hobbyist workshops to industrial settings with equal reliability. Owners of this hammer place it at the top of their lists and love both the grip and the sturdiness of the E3-12BP. It’s almost impossible to go wrong with this hammer, although every once in a great while a poorly forged item will slip past. These defective hammers are still fully functional, but may include dents or poor grinding. This lightweight 8 oz (also available in 12, 16, 24, 32, and 48 ounces) high strength fiberglass ball pein hammer brings a soft and comfortable non slip grip with a permanent head to handle epoxy bond that will not loosen over time. For increased longevity, the patented exterior jacket will protect the handle core from missed strikes. 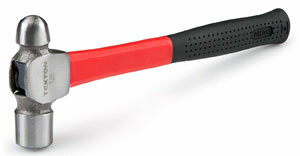 Virtually unbreakable and weighing only 1 pound with its polished steel head and small footprint, the Tekton fiberglass ball peen hammer is a perfect tool for light and sensitive work when a typical claw hammer won’t work as well. This tool is probably more appropriate for minor home use such as when bending soft metal on your vise. The most common complaint is that the head material is prone to dents and dings over time or with heavy use. One does not have to be a seasoned machinist to appreciate a work-worthy hammer, and this may be the best ball-peen hammer you will find. 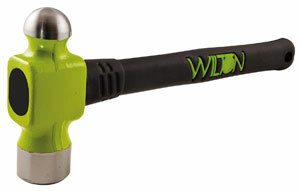 The 24oz Wilton BASH 32414 Ball Peen Hammer brings strength and precision in an indestructible package. 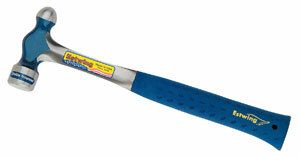 The handle is made with unbreakable technology which uses patented spring steel rods throughout. It comes with a vulcanized rubber No-Slip Grip, and the tapered design eliminates vibration. There is even a safety plate to prevent the head from dislodging during heavy usage. The 14-inch handle and 2-inch head keeps this 2 pound workhorse always swinging. The hemispherical head is the best for metal forming or deforming, popping fender dents or setting rivets safely and efficiently. For those determined to buy American be advised the package states the hammer is designed and engineered in the USA but the product itself is made in Mexico. This does not necessarily detract from the value of the tool, and it is certainly one of the top ball pein designs you are likely to find. Unless you’re determined to have only USA made tools in your collection, a Wilton machine hammer is worth taking a second look at. This smaller ball peen hammer is only 6-1/2 inches long, making it perfect for confined spaces where a full-sized hammer cannot fit. The 8-ounce heat treated, drop-forged steel head provides plenty of durability and power, while the high impact, vibration-absorbing fiberglass handle has a non-slip rubber contoured soft cushion grip to provide the best possible handling experience. The smaller size of this hammer make it an excellent choice for a number of projects. Some individuals even use it for kitchen or family-oriented jobs. The small size makes it perfect for tight spaces or precision work, such as jewelery-making. The primary benefit of this hammer is also its Achilles heel. Being shorter in design, it won’t be able to tackle projects where reach is vital. Additionally, the shorter handle means it won’t put out as much force as a longer-handled model. When buying, simply keep in mind that this ball peen is designed for specific tasks and is meant to be a compliment to your regular model, not a replacement. 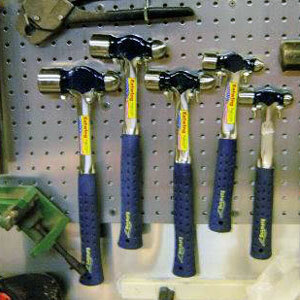 Ball peen hammers are designed primarily to form and shape sheet metal. They can also be used for peining rivets or striking punches and chisels. 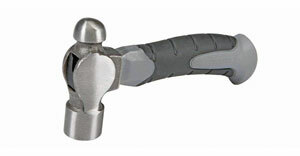 You will find these hammers being used in many fields, such as machining, mechanics, metalworking, and jewelery making. Tekton is trash. A ball peen hammer that dents or dings is just trash. Never tried a Wilton. Estwing is a brand you can trust for any kind of hammer.